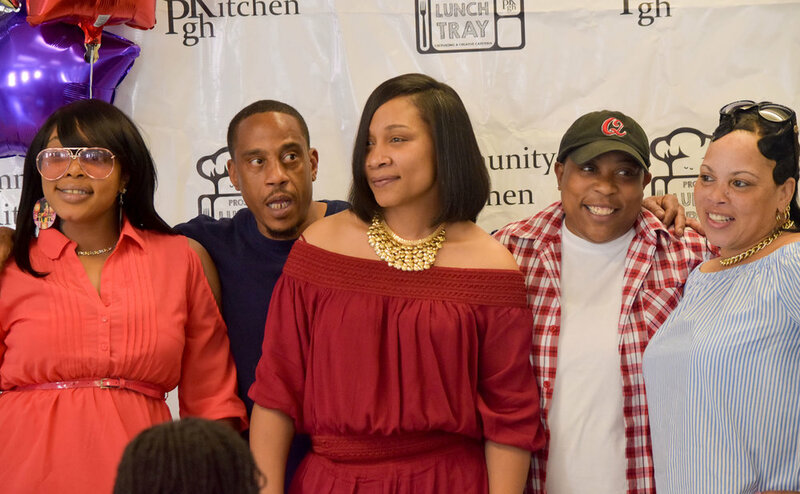 Joined by family, friends and past graduates, six individuals previously burdened in job searches by barriers such criminal histories or substance abuse recently celebrated their graduation from Community Kitchen Pittsburgh’s 16-week culinary program—and all already have job offers. Though she will take one of several job offers she already has, graduate MarDaja Porter is thinking bigger—and she thanks the support she received at CKP for making it possible. “I want my own business. I want to start my own catering company and eventually spread out and open food trucks,” she said. The program, ran through the CKP facility at 1323 Forbes Ave., is open to anyone who has a desire to work, but needs help in either gaining needed skills, a GED, or, like most of the students, overcoming a criminal record. The program is divided into two eight-week tiers. In the first, students learn the basics of food safety, sanitation, knife skills, and identifying equipment and product. In the second tier, they learn technique, ordering, inventory control, and how to execute orders in a fast-paced commercial kitchen. Executive Director Jennifer Flanagan said she started the program because she saw a need to help “completely outside the economy,” with lots of barriers who needed lots of help. On the other hand, she also saw a need to provide fresh healthy institutional food. They put the two together. “The best part of this program is today—graduation day. We get to see the transformation,” she said. Lead Chef Trainer Darryl Coaston, who handed out awards to students during the Dec. 9 ceremony, echoed that sentiment, saying they key to the program is having people who can relate to the students’ situations and still support them without defining them by what they’ve done. “It’s a very important program for the community. I was on the other side of this—coming from incarceration, homeless, not know what to do,” he said. One of those trying to do so, is graduate Emily Geissinger, who said without the support of everyone at CKP, it would not have been possible. “I’m 30 years old and the past 10 years haven’t been easy, it’s been pretty dark at times,” she said.